The original Audi TT was a target for jibes about its somewhat dainty curves – a car for hairdressers being the main epithet. Get behind the wheel of a TT though, and your opinion would change within a couple of corners, for the TT was both quick, and truly planted through even the tightest of fast bends. The TT name is taken, somewhat strangely, from the world-famous Isle of Man TT – an event for motorbike racing, but given its grip and poise through the twisties, it is perhaps well-deserved. The latest Audi TT is styled in line with their range – tight, muscular bodywork in a now-distinctly Germanic design. If the Audi TT still seems like it’s still a slightly feminine, then it’s at least a bodybuilding, steroid-pumped version you wouldn’t want to mess with. Our customer bought in their newly-purchased ex-demonstrator, an Audi TT Roaster Quattro Black Edition with just 60 miles on the clock. Yes, we know it’s red, but the Black Edition offers the Misano Red Pearl Effect colour, unique to S-line and Black Edition models. This also compromises of titanium-look alloys, radiator grille and frame in polished black, plus tinted rear windows on the Coupé. Red and black has always been a good combination, and we were going to make this particular version look even better, with a New Car Protection Treatment. 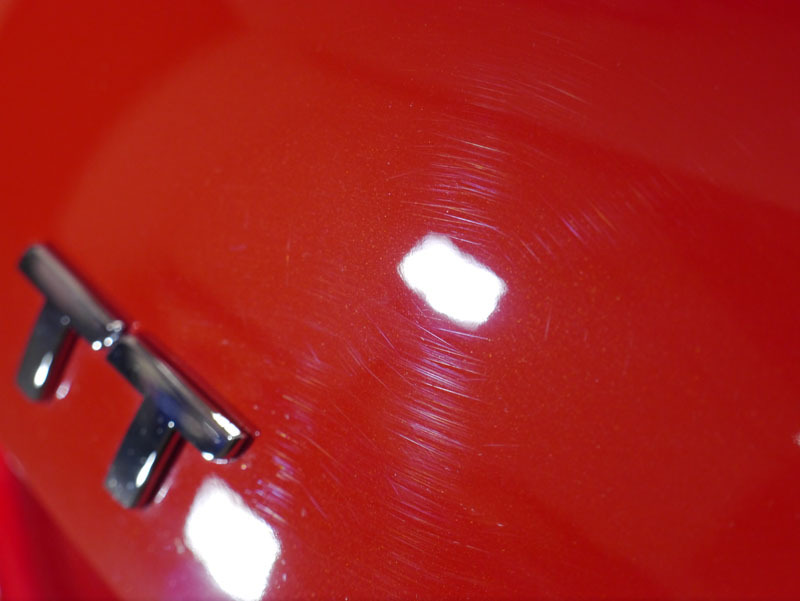 The TT Roadster was already covered in heavy swirls – the results of poor washing techniques. Sticky tree sap also showed evidence of the TT being left outside for a period, so there was plenty to do, regardless of the car being nearly new. 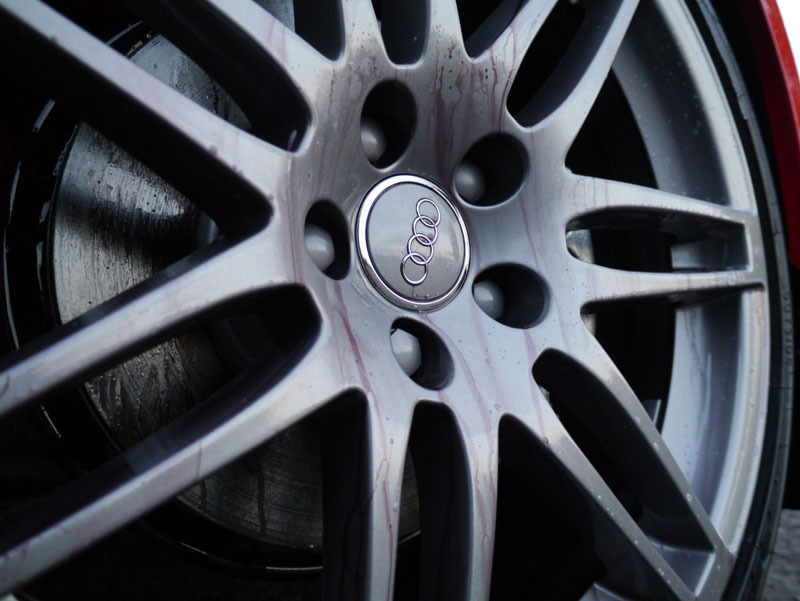 Although the wheels weren’t too bad, there were already sign of brake dust getting ingrained, so we broke out two products that clean safely and deeply; Valet Pro Bilberry Wheel Cleaner, and Bilt-Hamber Korrosol Fallout Remover. The biodegradable Bilt Hamber Surfex HD was then used to degrease the gaps and doors shuts, to ensure no grime was missed. Time for a thoroughly enjoyable part of the detail process – snow foaming. For this, we used the award winning high-foaming Ultimate Snow Foam, which breaks down and loosens dirt, making removal of it far easier than a tradition straightforward wash – meaning less chance of further damage to the paint surface too. After a quick rinse, we then used ValetPRO Citrus Tar & Glue Remover to get rid of any road grime, made quick work of removing that sticky tree sap too. All done, we gave the car a shampoo with Valet Pro Concentrated Car Shampoo, before rinsing the car with water filtered through the excellent Aqua Gleam De-ionising Water Filter, eliminating any chance of watermarks or streaking – a result of minerals being present in normal tap water. Drying was done with a soft Gtechniq Zero Scratch Microfibre Drying Towel. Being a Roadster, the fabric roof was in need of protection. 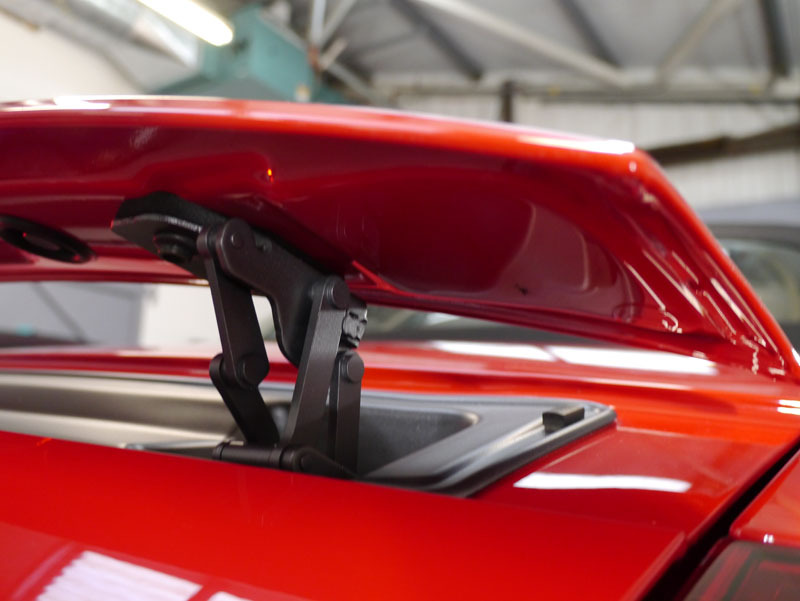 While a convertible soft-top will obviously not leak from lack of protection, there are a couple of factors to remember; UV rays, industrial and environmental fallout, plus extremities in weather conditions all go towards damaging a fabric roof, considerably shortening its lifespan. 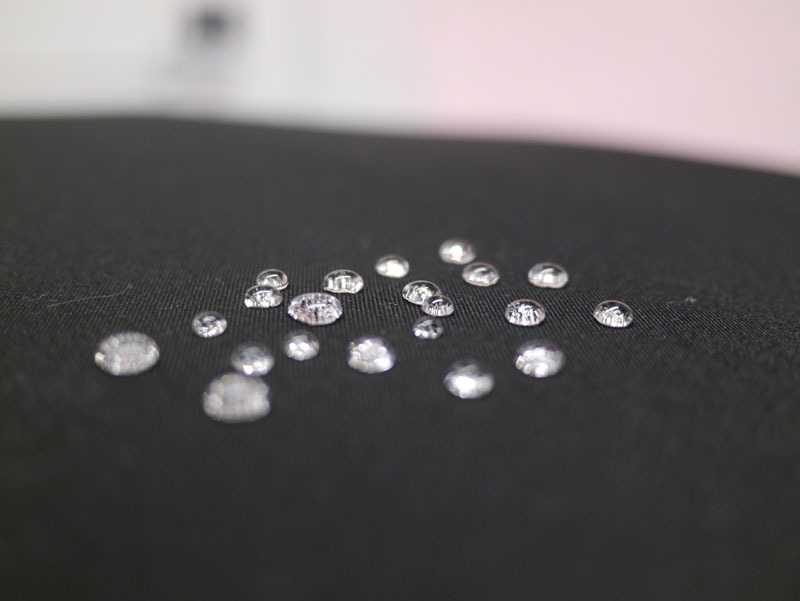 For combating the above reasons, plus the fact it gives awesome water beading qualities, we applied the brilliant German designed and manufactured Nanolex PREMIUM Textile Sealant for Convertible Tops. It was now time to decontaminate the paintwork, and for this a medium-grade Bilt-Hamber Auto-Clay bar was put into action, removing the ingrained grime quickly and efficiently. The next stage was to bring that wonderful red paintwork back to better-than-new, and that meant machine-polishing stages. As usual, we used the reliable FLEX PE14-2 150 Rotary Machine Polisher, along with the swirl and hologram-killing SCHOLL Concepts S40 Anti Swirl-Compound Black. Although this is usually reserved for darker-coloured cars, it also gives a superb lustre and depth to colours like the Misano Red Pearl Effect. Machine polishing stages done, we gave the TT a wipe down with Gtechniq Panel Wipe Slow Evaporation Residue Remover, to get rid of any traces of the polishing compound, ready for the sealant stage. Again, we went with the sublime Nanolex ULTRA Paint & Alloy Sealant, for its ability to not only protect paintwork for many months against fallout and UV rays, but also the fact it has superlative water sheeting and beading ability. Glass cleansing and protection is just as important as any other surface, if not more, in our opinion. Keeping vision as clear as possible is paramount, especially in a car with the performance of the TT Roadster, so we firstly cleansed the glass thoroughly using Nanolex PREMIUM Glass Polish, before applying a layer of Nanolex ULTRA Glass Sealant. Now, the heavier the rain falls, the less need for windscreen wipers there is! To not only give the tyre walls protection, and of course a great look, we went with the classy Swissvax Pneu for the satin sheen finish it leaves. 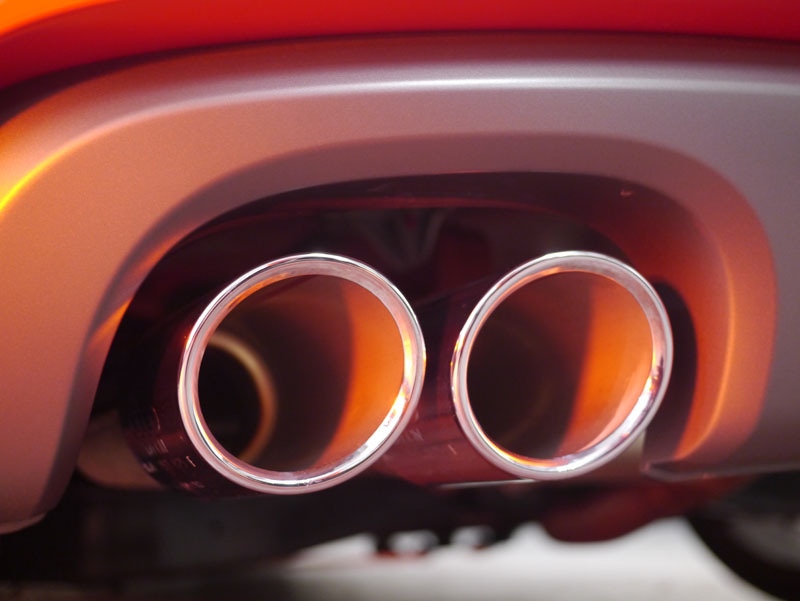 Finally, any exterior chrome and metal – such as the exhaust tips and Audi badges – was cleaned with Gtechniq M1 All Metal Polish, giving them a high, new-look shine. Overall, this Audi TT Roadster Quattro Black Edition now looks better than new, and ready for the harsh winter weather that lay ahead.